A fungus believed to have aphrodisiac qualities, the White Truffle has been a delicacy in Italy for centuries. Now that it has come to India, Anamika Butalia tries it out first hand. Around the ninth century A.D., a fungus with a rocklike exterior was found to have aphrodisiac qualities for pigs. Naturally, this captured the attention of the Italians who stopped listening at “aphrodisiac”. Never mind that the White Truffle contains pheromones that specifically attract sows. If it worked for pigs, then why not for humans too? And so the Italian fascination with truffles was born. “There was no evidence whether the aphrodisiac worked for humans,” says Sebastiano Spriveri, the charismatic chef of the Four Seasons Hotel in Milan. 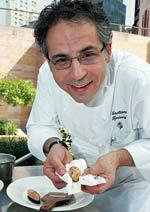 “But this tuber soon became a favourite in Italian kitchens and several foods were designed around the truffle.” Chef Spiveri has travelled to Mumbai’s Four Seasons Hotel to conduct a class on the truffle in Italian food. So, we’re gathered on the veranda of the Four Seasons restaurant, Prato, to watch Chef Spriveri whip up a few truffle recipes, while he explains why the exotic white truffle is such a rage back in Italy. It’s all about the distinctive aroma of the white truffle (biological name: Tuber Magnatum Pico)—an aroma reminiscent of garlic, shallot, cheese and LPG-like gas. It’s commonly harvested by pigs and dogs who go sniffing around and digging them out of the soil. It cannot be cultivated and grows only in cool and dry conditions in certain parts of Italy, Serbia and Turkey. Muddy on the outside, the white truffle is white or pink-veined on the inside. And it is rare— hence the price. “Other truffle varieties like the black or summer truffle or even the banketi (winter truffle) are found quite easily compared to the white truffle,” says Chef Spriveri. Three years ago, in 2005, the supply of white truffle was low and prices for 30 gram went up from m2,000 (Rs 1.26 lakh) to m6,000 (Rs 3.78 lakh). But large sums are common where white truffles are concerned. The largest of its kind was found at the annual 20-day International White Truffle Fair in Alba in 2007. A truffle weighing 1.5 kg was auctioned off for a record £165,000 (Rs 1.24 crore approx.). It’s not just the price, however, that prevents restaurants from stocking up on truffle—it also has a very short life. It can be stored for 10 days maximum, even if refrigerated. And if the conditions are either extremely humid or dry, the truffle perishes. After cleaning, the truffle is cut much like garlic and its shavings are added to the dish. Chef Spriveri says: “If you add truffle while cooking, you lose the strong aroma and flavours.” Once the dish is prepared, about 4-5 gram of truffle shavings are added as garnish and even then, no strong aromatic garnish like basil or parmesan cheese must be used as accompaniment. 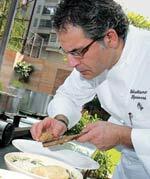 Chef Spriveri holds the truffle up and breathes in its aroma. “It’s too strong for a dog to keep from feeling disoriented,” he says. “In the areas of Piedmont and Alba in Italy, where white truffles are found, they still can’t prevent dogs and pigs from eating them!” In fact, at the Truffle Fair in Alba, pigs have often broken through their sty and consumed some of the truffles on display. 1) Truffle can cost up to m2,000 (Rs 1,26,000) for 10 grams. 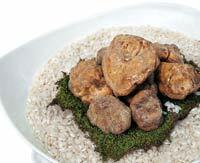 2) White truffle is found only in north and central Italy. It cannot be cultivated. 3) This tuber grows around trees like Oak, Birch, etc. 4) Pigs and dogs are used to hunt down truffles. 5) Truffle should not be treated with water. It should be brushed clean and stored in a relatively dry climate. Black: Not as rare as the white truffle, the black truffle is less expensive. Its garlic aroma is lighter and more influenced by the soil it grows in. Summer: The Black Summer Truffle has hints of garlic and earthy aroma. The flavour is light and is lost within seconds of adding it to the dish. Banketi/ winter: Unlike the Summer Truffle, the Banketi has a stronger aroma than flavour. 1) Toast the carnaroli rice with a little butter in the pan with the shallots and bay leaf; moisten it with white wine. 2) Pour the boiling broth until the rice is cooked. 3) Add the thyme leaves; finish cooking and add salt to taste. 4) Remove the rice from the heat, gently stir by adding butter and grated parmesan cheese. 5) Leave to rest for one minute; garnish with shavings of white truffle and serve. 1) Boil the potatoes in salted water. 2) Add flour, salt, cheese, nutmeg and egg to the potatoes and mash till smooth. 3) Cut into sausage-like shape and add to boiling water. Once the gnocchi rises, add into sauce. Garnish with white truffle. Sauce: Cut the zucchini into cubes and sauté. Simmer the saffron in cream and add zucchini. Add seasoning to taste.